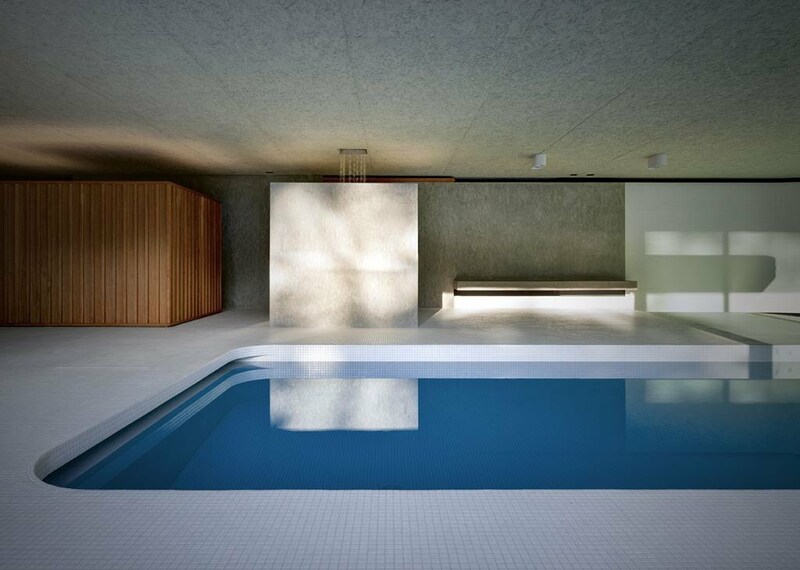 Architects Act_Romegialli extended a home in Northern Italy by adding an indoor pool in the form of a subterranean pavilion under the house’s garden. 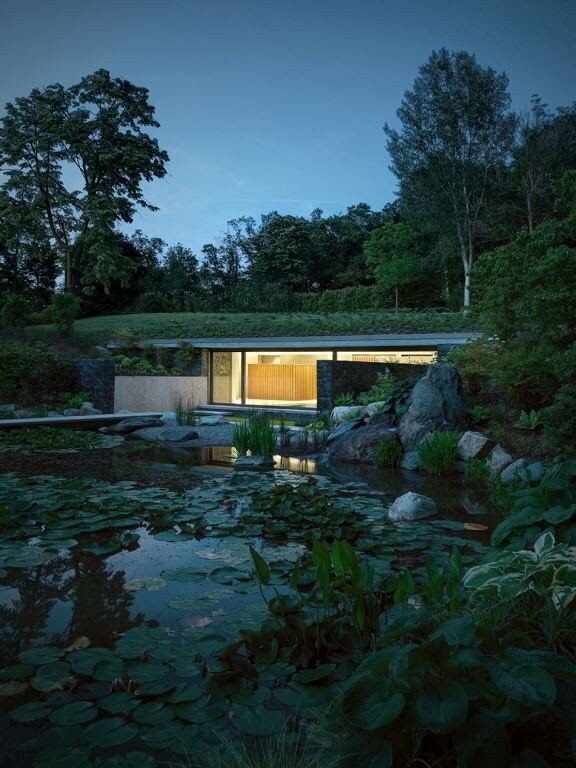 The impressive, minimalist interior has a glazed facade that opens to a small artificial lake with lilies. “The client's requirement was for a pavilion to be connected to the main historic house causing the least visual interference with the surrounding parkland. 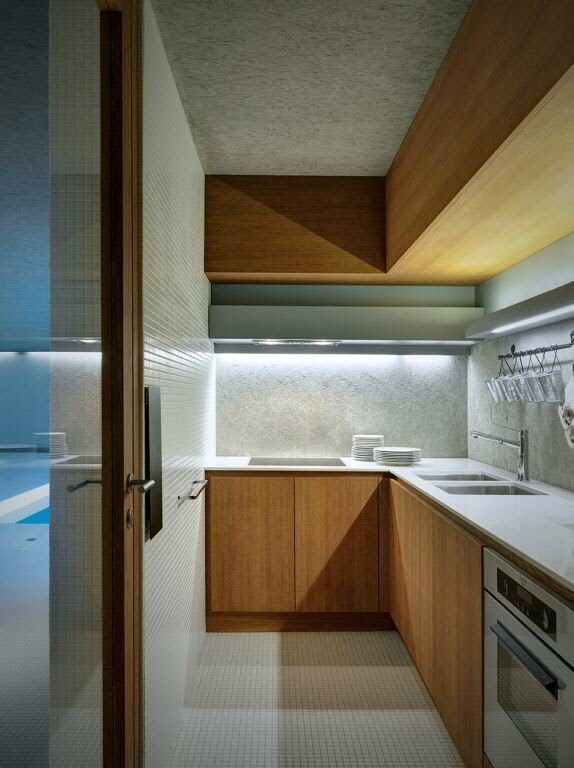 The pavilion was for an indoor pool, and some space for fitness, service and leasure in a climate controlled space. 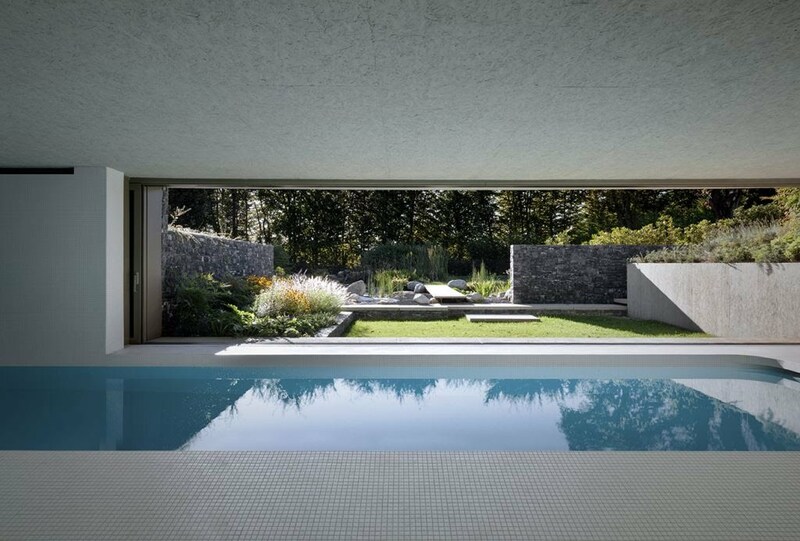 The main house, an early 1900 liberty building had been renovated by the clients ten years previously. 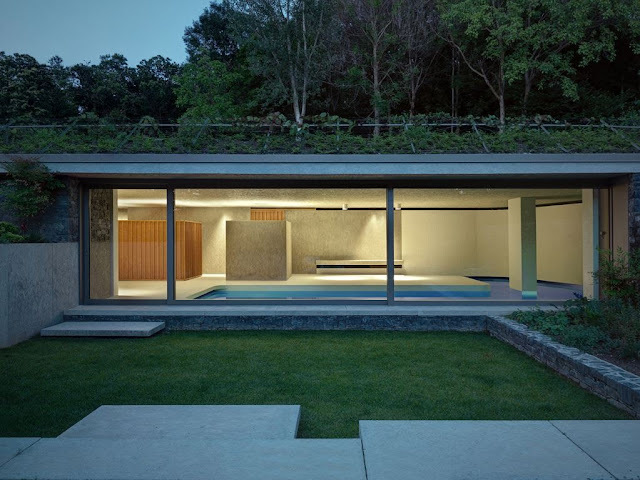 The main house ground floor sat 100 cm above the external ground and as such had little connection to the surrounding parkland.The client also desired a glass enclosed space attached to the main house to enjoy the view of its natural surroundings. 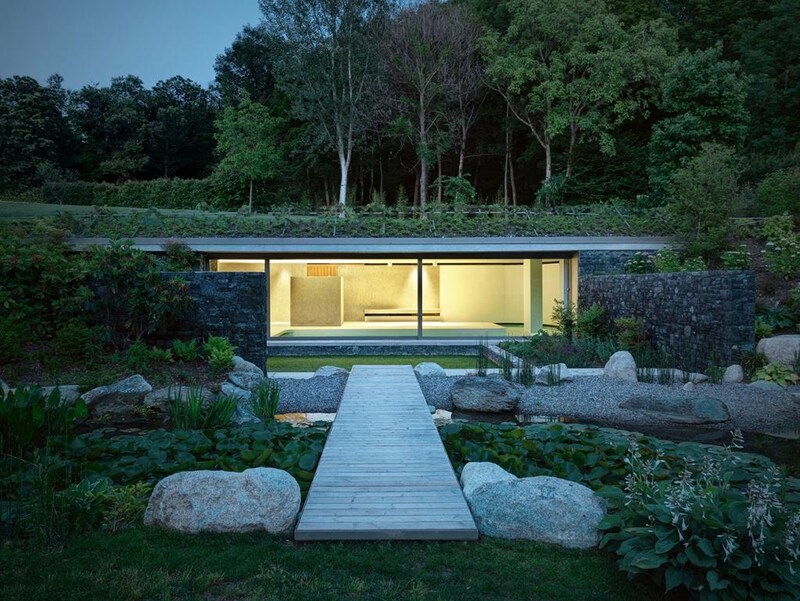 The previous renovation of the house included landscaping and the addition of a small artificial lake in the south corner of the parkland. 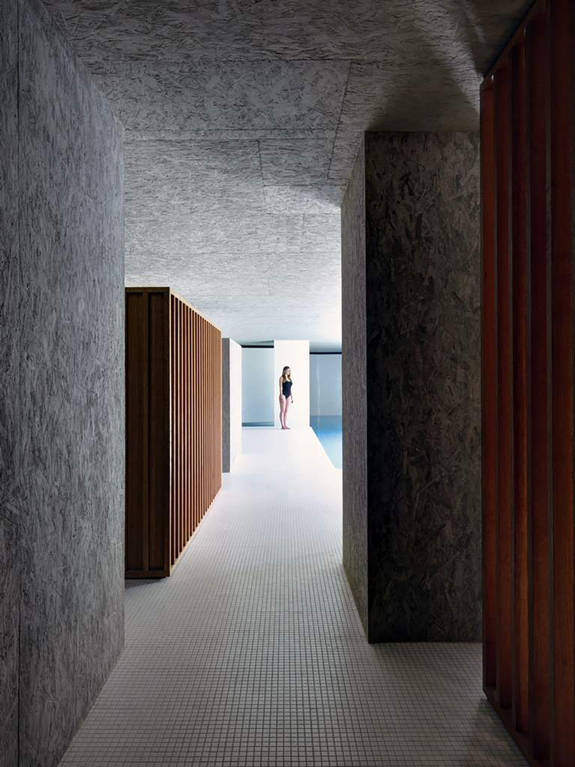 On this basis and after an accurate topographic survey the following principles were adopted to create minimal visual impact, place the pavilion volume underground. Location informed by the natural topography of the parkland. 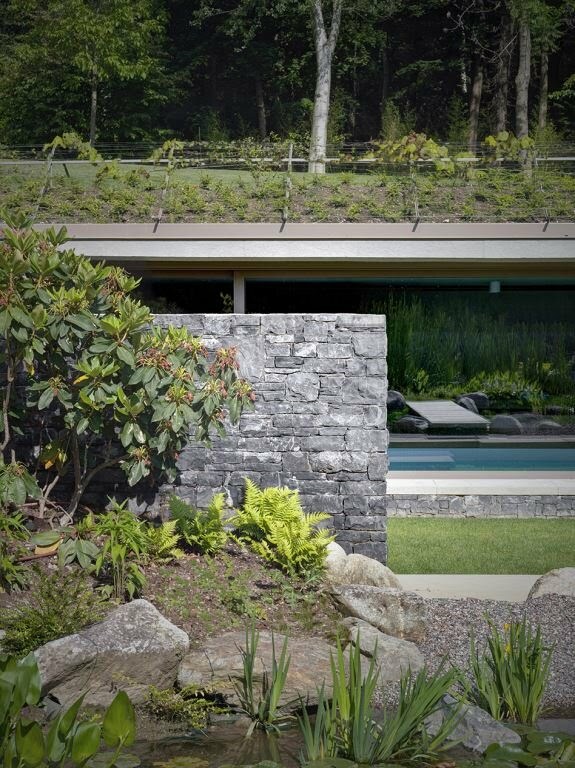 Use the different ground levels to capture light inside, not with zenithale light but with windows directly connected to the outside landscape and lake. 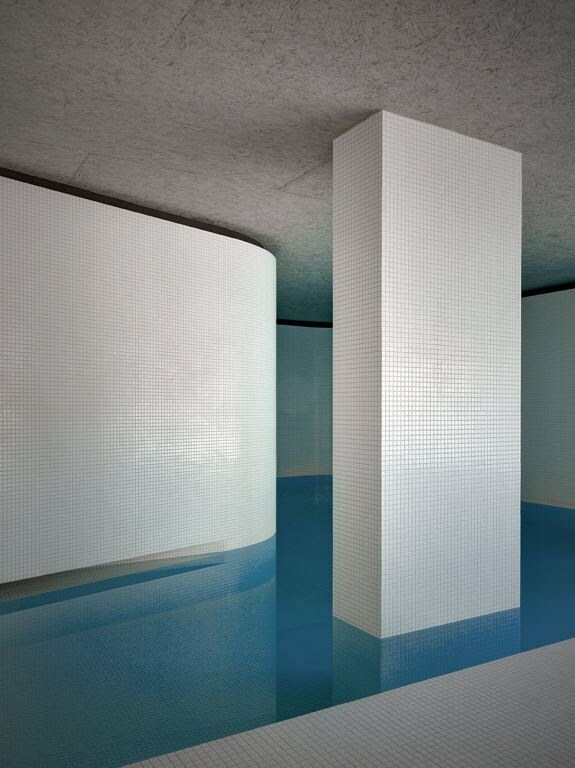 Visually connect the underground pavilion to the artificial lake. 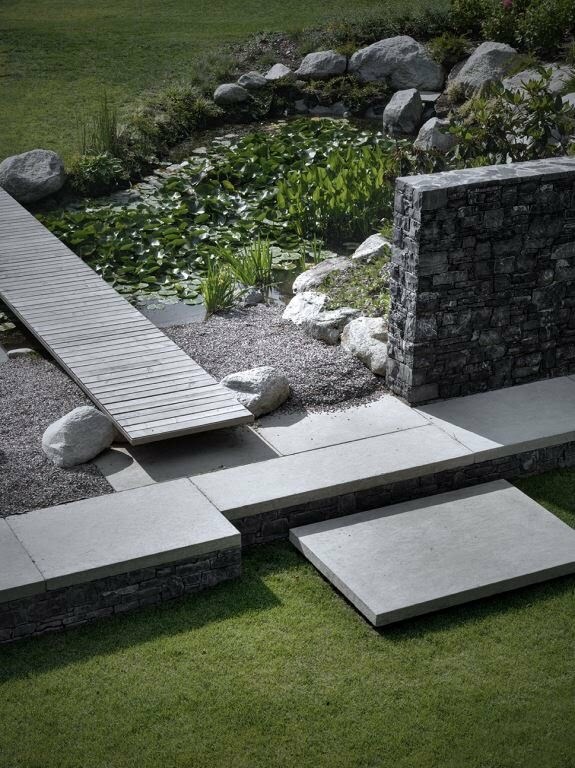 Locate the pavilion far away from the main house in a strategic position, to create a totally new and independent space reached by a path that emphasizes the sense of privacy. 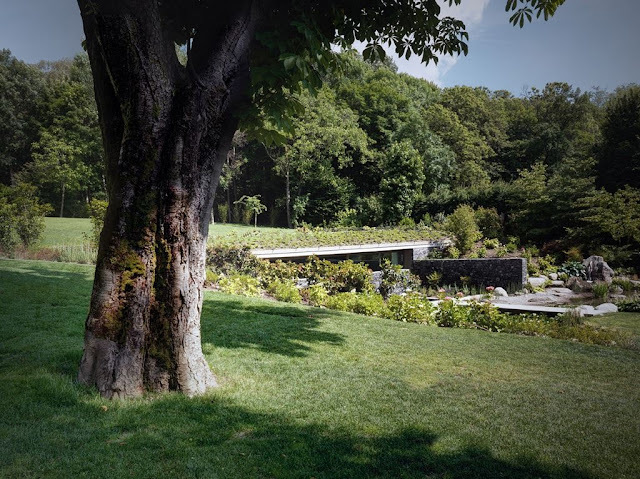 The location of the underground pavilion far away from the house would then create an interesting and dynamic relationship between the two spaces. 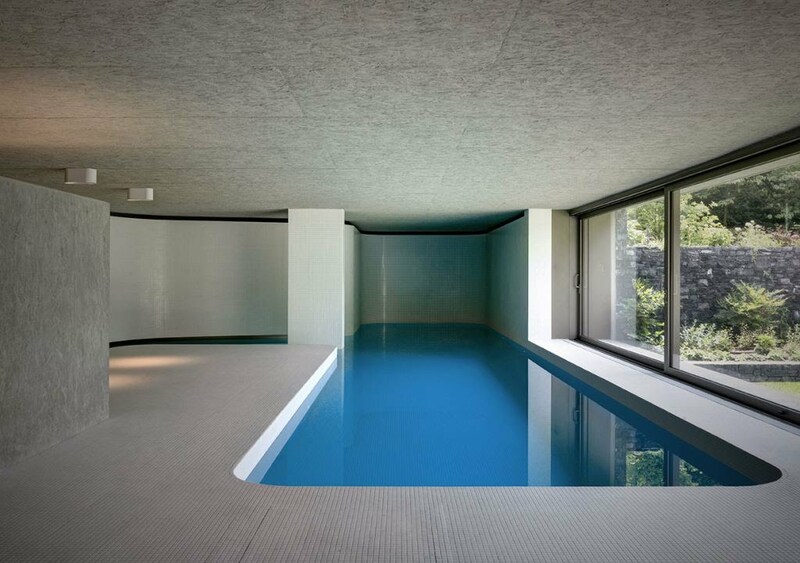 Connect the main house to the underground pavilion and pool via a tunnel. An irregular path was determined by the established trees which were to be protected. 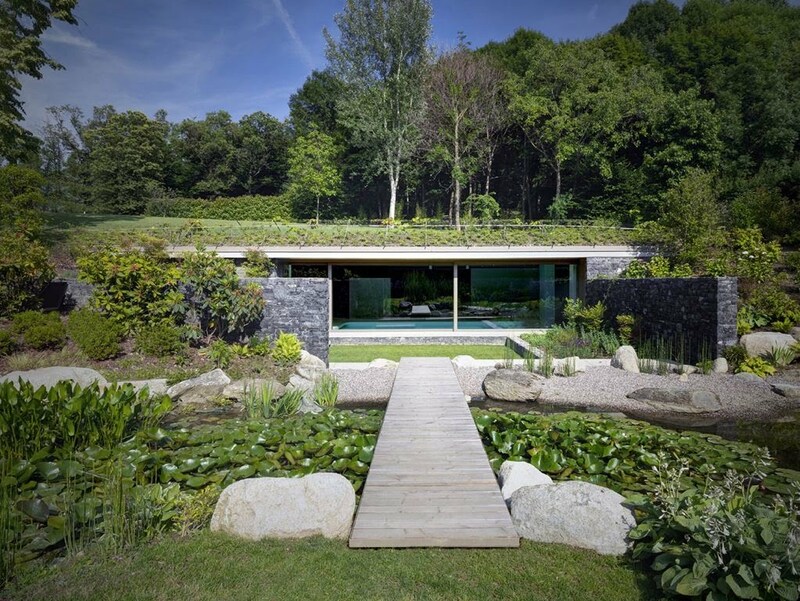 The tunnel also connects via a few steps to a second small glass enclosed conservatory totally open to the surrounding parkland. 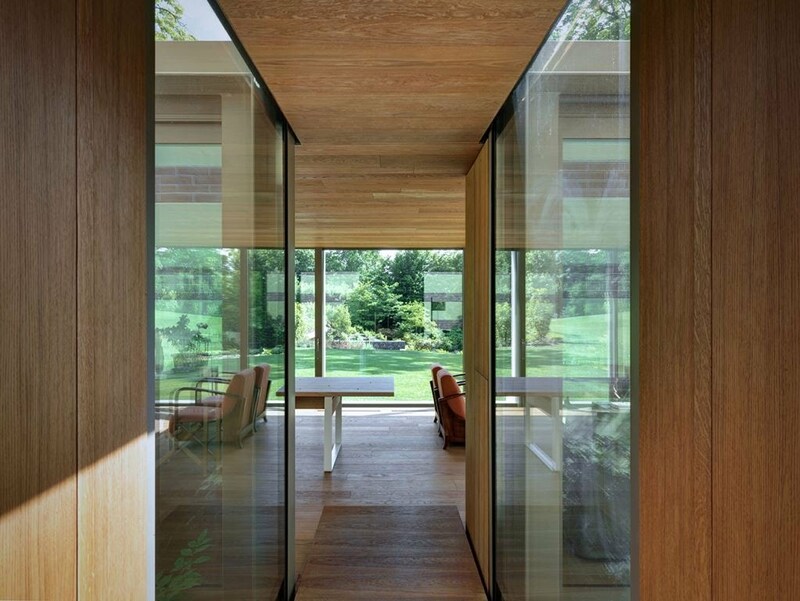 A glass enclosed narrow bridge connects the conservatory to the main house. 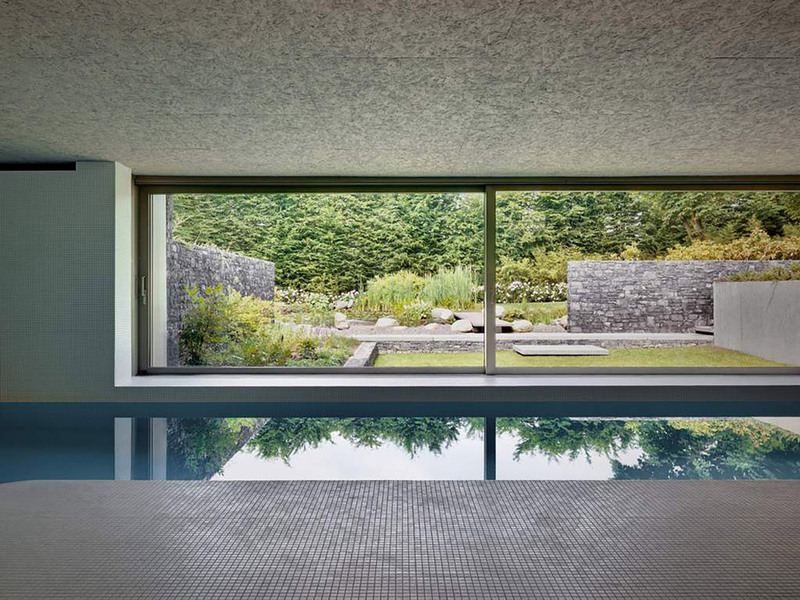 The specific design of the structural steel was placed outside the glass perimeter. 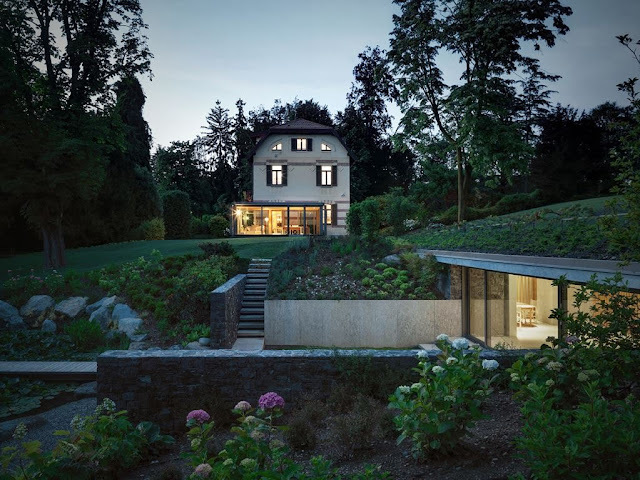 This was to give depth and emphasis to the internal volume and at the same time make the window frame design secondary.Stone footings of the conservatory on the south side of the main house enabled changes in the surrounding garden level, to give a direct connection between the garden and the internal space. The pavilion space containing the indoor pool, fitness area and small kitchen is based on a sequence of simple geometric volumes in either wood or cement to contain the various functions. 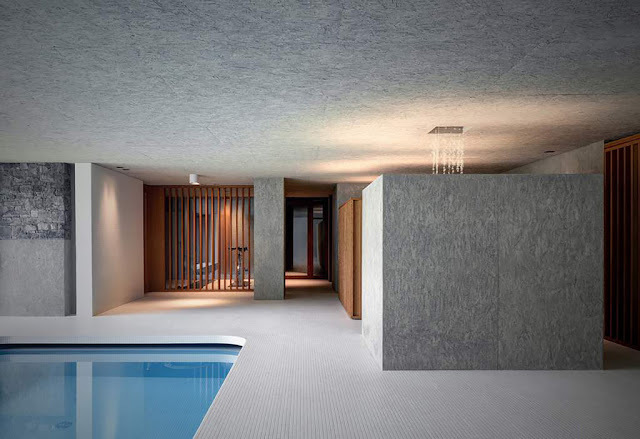 All technical requirements for ventilation, climate control, automated pool cover etc were designed to be as discrete as possible within the overall design. 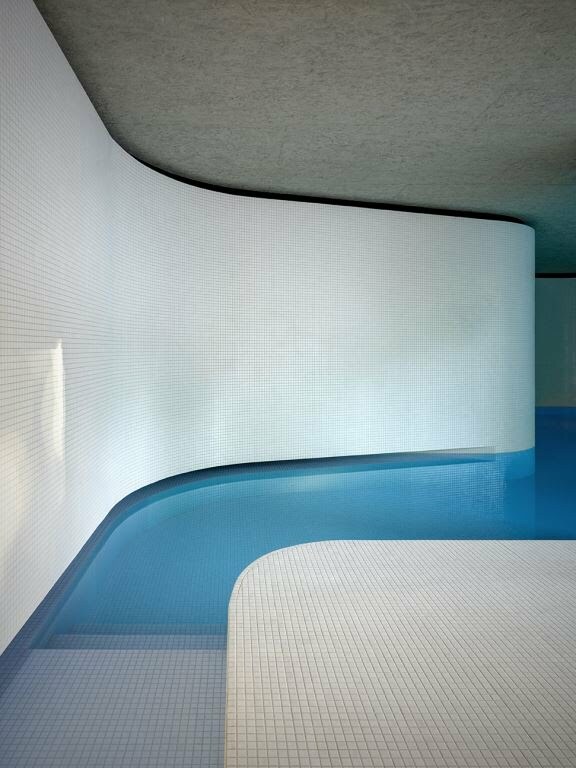 Choice of material for the pool lining and surrounding pavement needed to be durable and, neutral in colour. 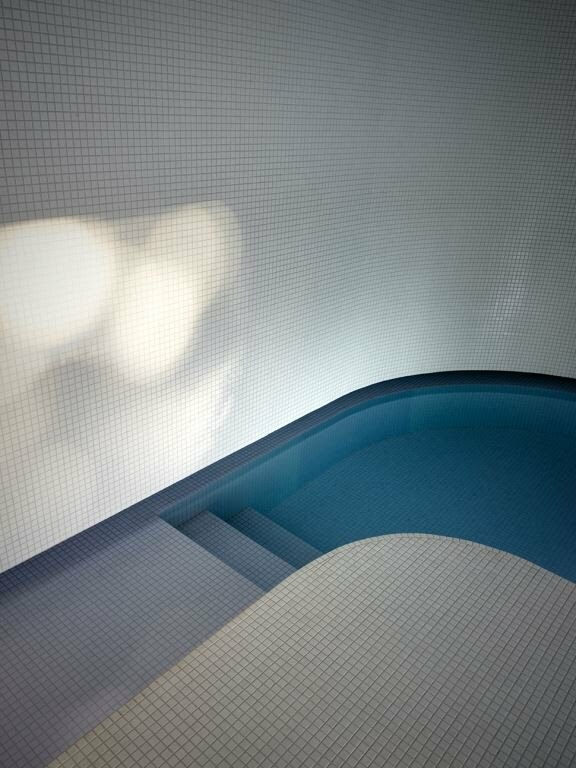 It also needed to be able to cover steps, ledges and curved surfaces (pavement, walls and pool lining). 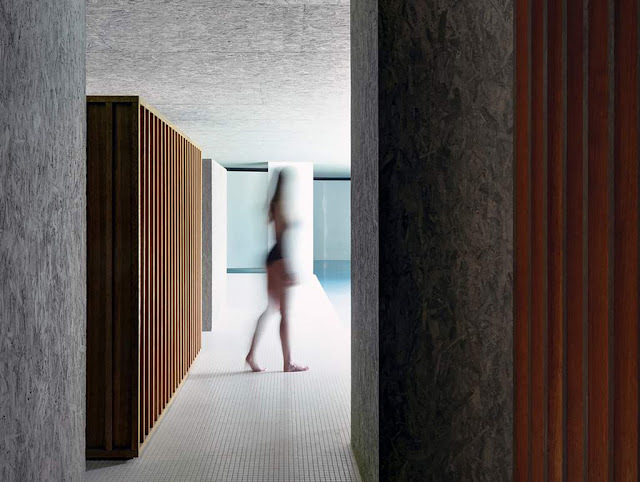 The aim was to achieve a sense of continuity within the volume inside and outside the pool. 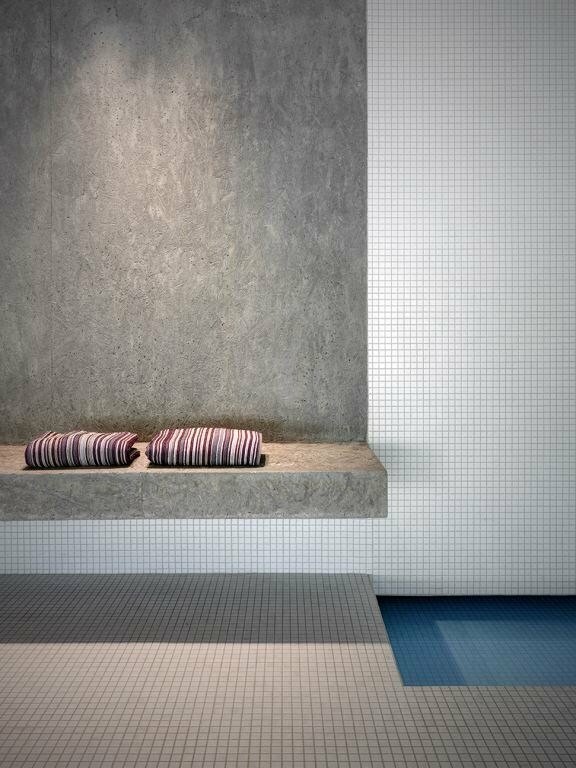 A small white ceramic mosaic tile was chosen. The choice of continuity of material creates an effect: a mass of water finds its natural resting state and settles in the lowest part of the volume, held by a dynamic and at the same time gentle form before it slowly follows its course down to quietly settle in the pool.